While Lincoln issued the Emancipation Proclamation on January 1, 1863, the August 8th observance is common to parts of Kentucky and Tennessee, where then-governor Andrew Johnson freed his personal slaves on August 8th. 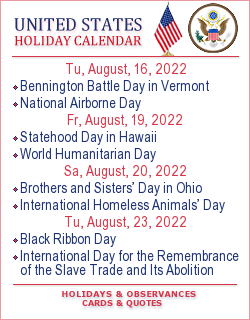 More commonly known is the annual “Juneteenth National Freedom Day,” a state holiday recognized by the Kentucky legislature in 2005. June 19, 1865, is the date slaves in Texas were freed by union troops.